Iam currently the President WCC West/Central Africa. I wish to forward to you my e- mail for correspondence. I have just visited the Pathmakers exhibition in new York. I would like a copy of the July 15 issue of your Journal on the theme of the exhibition. Can you tell me when it will be published? I am on an endeavor to have my mothers contribution to porcelain art recognized. She was born and raised here in the state of Arkansas. Recently, I had some of her work appraised by Little Rock appraiser Jennifer Carmen and she said that my mothers porcelain work compares to Lladro porcelain. She taught porcelain extensively throughout the southeast US and had over 70 published articles in ceramic journals in US. Her techniques and abilities were sought after worldwide. Her work began in the late 1960’s in casting of clay ceramics and she advanced exclusively to porcelain by the mid 1980’s until her death in 2010. She advanced herself into the mixing of certain mediums to produce her own exclusive colors for skin tones, etc. She was known for ability to produce beautiful flowers and blend colors that produced outstanding works and one of a kind porcelain works of art. My endeavor is to have her recognized for her contribution to Arkansas as an outstanding artist. My father Dean Wisdom is still living and was married to my mother for over 50 years. He owns much of her work, as I do. I have contacted The Arkansas Heritage Museum and The Craft Council of America. Any help or direction you could provide would greatly be appreciated. If you would like photos of some of her work, I would be happy to send them to you. I promise you will not be disappointed. Truly, she was an outstanding artists. Thank you for your time. Please see my email correspondence for a reply to your enquiry. 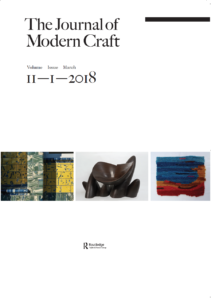 The Journal of Modern Craft 8.2 is now available to purchase. You can buy an online version of the one issue for £85 (http://www.tandfonline.com/toc/rfmc20/current), or alternatively, which I think would be a better option, you can buy a year’s subscription for £31 (http://www.tandfonline.com/pricing/journal/rfmc20#.VokL5BFH3zI). Do get in touch with Taylor and Francis via email – [email protected] – to ensure that you receive the copy that you would like (8.2). For more information see here. Thank you for your comment and the information about your mother’s ceramic practice. For further guidance for articles please follow the link here. We do not often publish articles about single makers without a thorough investigation of the historical, social or political contexts in which they operated. Do keep this in mind if you would like to submit an article and make sure to read previous issues of the Journal to get a sense of the tone and content of the articles we publish. webpage? My blog iss iin the very same niche as yours and my visitors would really benefit from a lot of the information you present here. Thank you for your comment. Please feel free to quote from our blogs, so long as you adopt to convention of providing a reference and a link back to the site.